This is a make-ahead recipe! Make the tuna mixture the night before, then when you're ready to eat dinner, all you do is form and fry the tuna croquettes. This old-fashioned recipe is delicious comfort food. This is a great way to make a meal in a hurry. Kids especially love this recipe. You could make this croquette recipe with salmon too. Just drain the salmon, remove the bones, and flake the salmon into the sauce. You can double this recipe, too. Just make sure that the mixture is completely chilled and fairly firm before you start shaping the tuna croquettes, or they'll just fall apart in the frying pan. Serve this classic recipe with some peas, cooked until tender and tossed with some butter, salt, and pepper, and a fruit salad. Melt the butter in a medium saucepan and cook the onion and garlic until tender. Add the flour, salt, pepper, and paprika and cook, stirring, until mixture bubbles. Cook and stir for 2 minutes. Add the milk, and cook, stirring with a wire whisk, until the sauce thickens and bubbles. Add the drained tuna and mix gently but thoroughly. Put the tuna mixture into a medium bowl, cover, and refrigerate at least three hours, or overnight. When you're ready to eat, moisten your hands with some water and shape the tuna mixture into 8 ovals. Beat the egg with 1 tablespoon water in a shallow dish. Coat the croquettes with the dry breadcrumbs, then dip them into the egg/water mixture, then again into breadcrumbs to coat thoroughly. In a heavy deep skillet, heat the two cups vegetable oil to 350 F. Gently put the croquettes into the hot oil using a spider or a spatula, and deep fat fry the croquettes for 2 minutes on each side until they are golden brown, turning once, carefully, with a spatula. 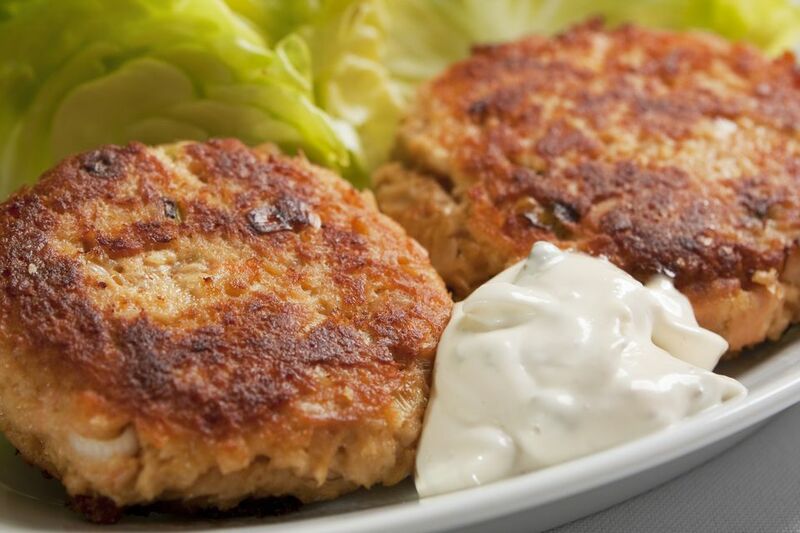 Drain the tuna croquettes on paper towels for a couple of minutes, and serve hot with tartar sauce, mustard, sour cream, or ketchup for dipping.